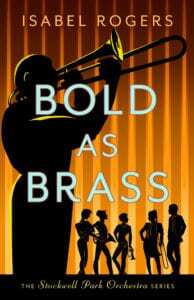 Author Isabel Rogers gives a behind-the-scenes view of the making of her second novel, Bold As Brass – coming to a bookshop near you this July. It wasn’t difficult, though. When I originally met my editor, Abbie Headon, she put up with me waving my hands around Kermit-style while I shuffled seventeen sheets of paper with plots written on them, spider-style, all over the kitchen table. She sensibly ate cake throughout. The point is: I have loads of plot ideas. The difficult thing was deciding which one to go for. *MY* Bold As Brass combines eviscerating satire of both the public school system and your bog-standard state comprehensive (sorry, Academy) with skulduggery from a washed-up composer and some frankly outstanding posh names. There is an off-duty police officer, a tweed outfit that puts the smoking into ‘smoking jacket’, and precision laser deployment of the words ‘stook’ and ‘befurbelowed’. Plus a trombone player called Carl. There are children and animals. There is gaffer tape and a drain plunger. There is a highly controversial brass fanfare. Take that, Cliff and Hilary. Bet you can’t compete with that kind of content. All our old friends are still there, apart from Fenella who is staying with her mother until her wrist mends, and Joshua who is probably working in a Starbucks by now. If you haven’t read Life, Death and Cellos yet (and why not? ), please don’t read this paragraph. What have I made the musicians of Stockwell Park Orchestra do now? Find out on 11th July. Or get me drunk and you probably won’t be able to shut me up. Better still, pre-order (yes, I know I swore I’d never use that term but it turns out it actually does mean something), because it makes an enormous difference to how much notice people take in the first week of publication. Even more so if you can pre-order through your local bookshop. More books are published in the UK per person than anywhere else. If a bookseller sees one of them is a solid sale before it is even published, it blips their radar and they get interested. Otherwise, the Farrago link here can connect you to Hive (a friendly online book ordering system that also donates to your chosen local bookshop) or others. It will be in eBook and paperback versions. As another incentive, if you tell me you have pre-ordered AND ARE TELLING THE TRUTH, I’ll send you a personal card to use as a book mark. Not that you’ll need it as you won’t be able to stop reading, obviously. Either tweet me or use the contact page here. The Stockwell Park Orchestra is in trouble – could this be their final performance?